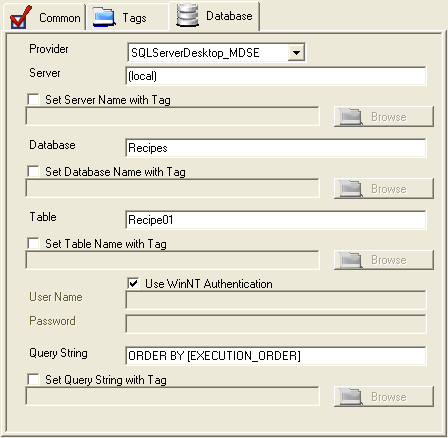 SQLServerDesktop_MSDE: Use SQL Server 2014 Desktop or MSDE database engine. SQLServer: Use SQL Server or SQL Server Express. MSAccess: Use Microsoft Access Jet Database engine. Oracle: Use Oracle engine. Does not automatically create database. You must create the database schema first to use this provider. ODBC: Use ODBC data source. Does not automatically create database, table, or field names. You must create database, table, and all fields with the proper names and data types first to use this provider. The name of the Server to use when the Provider is set to SQL Server Desktop or SQL Server. When enabled the Server name can be dynamically set with a Tag Parameter value when the Provider (see above) is set to SQL Server Desktop or SQL Server. The name of the Database to connect to. When using Microsoft Access specify the full path of the database. Example: C:DatabaseName.mdb. When enabled the Database name can be dynamically set with a Tag Parameter value. The name of the database Table to read the data from. When enabled the Table name can be dynamically set with a Tag Parameter value. Use Windows Logon Security Authentication when the Provider (see above) is set to SQL Server Desktop or SQL Server. User Name for database security. This text is appended to end of the database query to retrieve the data. It can also be dynamically be set from an OPC Systeme.NET Tag of a String data type. An example: WHERE [BATCH_NUMBER] = 5 ORDER BY [LOT_NUMBER]. When enabled the Query String parameter is automatically set from the defined Open Automation Software Tag. This allows dynamic assignment of the additional Query String to apply addition query and sorting arguments based on real-time data. Typically a Tag with a data type of String is used that has the data source defined as Calculation. This way real-time data automatically determines the additional Query String.